Sushi, yakitori, hibachi...there are many famous Japanese foods. So traveling to Japan is a culinary delight for many. But what about for a plant-based vegan like me? I ate well, but it wasn't always easy. 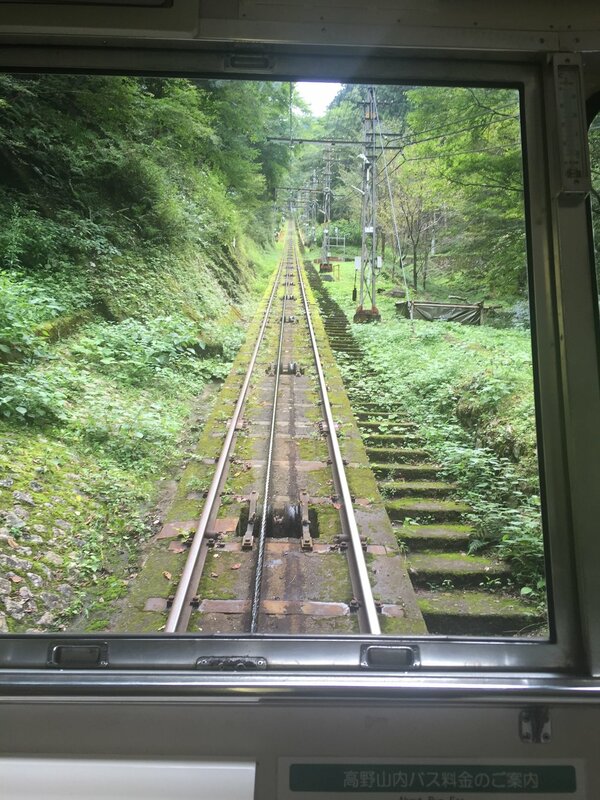 Traveling around Japan is amazing. The country is beautiful, safe and is relatively easy to navigate, making it a great destination for solo travel. I ventured to Japan the same way I traveled to most of the countries I've visited: on my own. But luckily I really enjoy traveling on my own and exploring new cities and countries. And that of course means trying different foods and restaurants. But here's the thing, being plant-based is not super easy in Japan. Being vegan is fairly straight-forward. But I prefer vegetable heavy meals, and that's not really how many Japanese meals are composed. 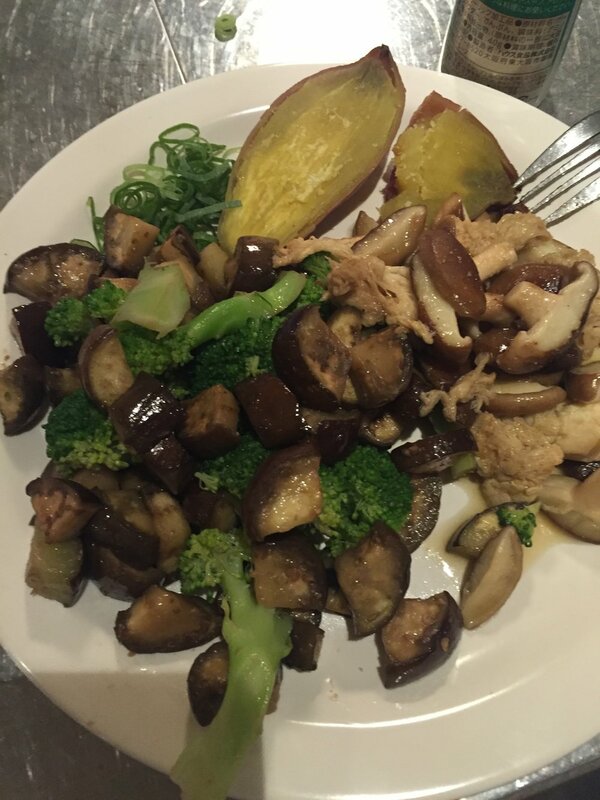 Instead many Japanese meals are super heavy on white rice and soy i.e. tofu. So, during my trip I ate some traditional foods, and I also prepared some meals for myself as well, just so I could make sure I was eating enough vegetables. The food here is beautifully prepared and presented. Each meal is served with a number of dishes, based upon the option you choose when booking. Although solo diners have fewer selections to choose from, but as you can see from the above photo, I had more than enough lovely vegan items to eat. Going clockwise from the rice, I had a little assortment of vegetables and gelled type items (vegan), broccolini with a type of mustard sauce on top, some sort of tofu type of dish with wasabi on top, a little dish of scallions to garnish the soup. The large dish with paper sticking up is a soy milk based vegetable soup. I also had some type of little pickled radishes, miso soup, a mild but tasty tofu dish with mushroom and snow peas, and a bowl of rice. Oh and the meal was also served with fresh tea and a lovely light dessert. I was extremely happy to eat here. Note: at Shigetsu, all diners are served in a private room. So if you come in a group you'll also be seated together in a private room, but if you're a solo traveler like me, you'll get a room to yourself! For this next frozen vegan treat, I went to Vegans Cafe. 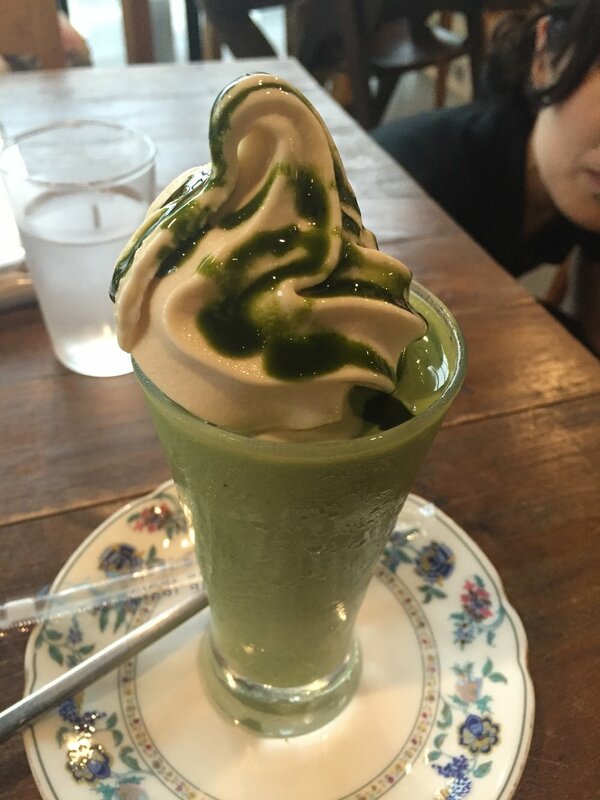 This is a soy milk matcha green tea soft serve. This felt like a decadent treat given the scarce vegan soft serve options. While in Kyoto I also went to Choice Cafe a couple of times. A absolutely loved this place because EVERYTHING on the menu is vegan and gluten-free. I felt like I was in heaven. 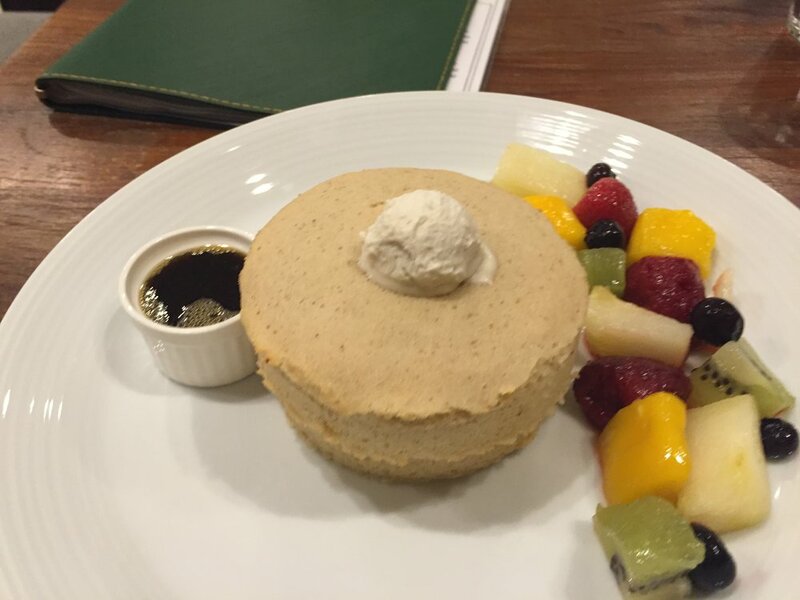 My favorite thing on the menu is the pancakes! I enjoyed them so much because they tasted more like cakes than pancakes to me. I also had the cheese burger and a soup which I really enjoyed. It tasted a bit different than I expected but I really liked it. Everything here is fresh and homemade including all of the vegan cheeses they use. 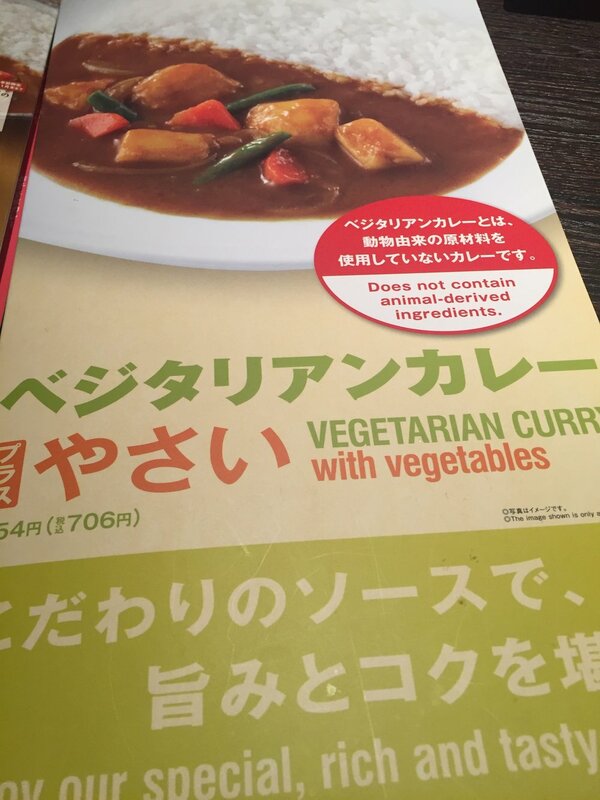 Here's a bonus tip: There's a chain restaurant in Japan called CoCo Curry which has a separate vegetarian menu that's actually vegan. In the US the restaurant is called CoCo Ichibanya, but around Japan, the signs say "CoCo Curry." But note, the curries although vegan, are not gluten free. I ate here anyway. This chain has saved me more than once when there wasn't a vegetarian restaurant around but I was super hungry :) They have a variety of vegetable curries on the menu which are heavy on the rice and curry sauce and light on vegetables. Nonetheless it's tasty. After several days of eating out, I was excited to go to the store and prepare my own meal. I made lettuce wraps filled with tomato, avocado and cucumber salad. I also made roasted sweet potatoes with stir-fried broccoli and eggplant. It was simple but also really delicious. I also ventured a bit outside of Kyoto for a few days to explore more and try different food. An hour and a half train ride and a cable car ride out of Kyoto, and I made it to Koyasan which is a quiet town nestled in the mountains. 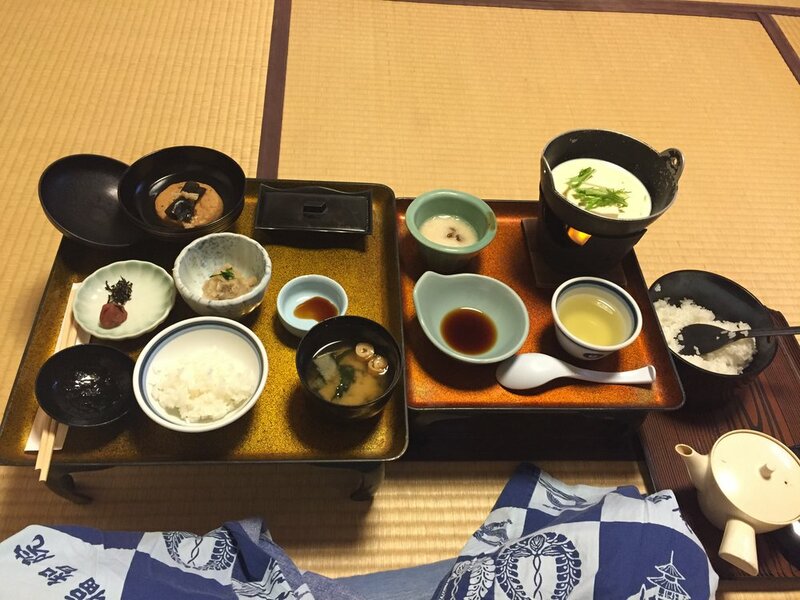 In Koyasan I stayed at the monestary/guesthouse/restaurant Fukuchiin. I absolutely loved it here and the room prices include breakfast and dinner! Check out this gorgeous vegan meal! The presentation of meals in Japan is much more lovely and intricate than I've seen anywhere else. All of this plant food was just for me! I ate it all. Kyoto, has a nice selection of vegan and plant-based foods, but one of my all time favorites in Japan is actually in Osaka, which is about an hour and a half train ride from Kyoto. Raw8 Cafe in Osaka is absolutely delicious and wonderful when it comes to super healthy and incredibly satisfying raw, vegan, plant-based meals. These are the raw samosas with a salad. I loved this meal. It was so flavorful and fresh. I must admit, I wanted/needed like 2 more in order to feel full, but as a general rule, I eat a lot. I also enjoyed a lovely raw, vegan and gluten-free strawberry pie with ice cream on the side. These are some of my highlights from Japan. What are your favorite Japanese foods? Anything I should try when I go back? Leave a comment below.